I just got this clutch from Gap and couldn't wait to style it! I love neon in small doses, so the neutral color-blocking paired with bright yellow was just what I've been looking for. I'm sure you'll be seeing it quuiiiitte a bit in the near future. You have the cutest skater skirts, I love them so much. Ooh I love neon - just wish it didn't wash me out when I wear it. Loving this new clutch, perfect paired with that cute skater skirt! I have a bright yellow bag that I love using to "pop" outfits like you did here. This whole look is perfect! Loving the vibrant clutch, its such a perfect piece t accompany your graceful B&W ensemble. Black and white with a pop of colour , I only have 3 words for you missy , you look gorgeous ! My favorite combo - skater skirt & button up! You look gorgeous! I love this entire look, and what a great clutch. Thanks so much for visiting my blog and I'm so glad to have you as a reader. I'm thrilled that I stopped by to visit you. Love your blog right back:) New follower. What a fun clutch, love the wedges too. You look great! Such a gorgeous outfit on you! 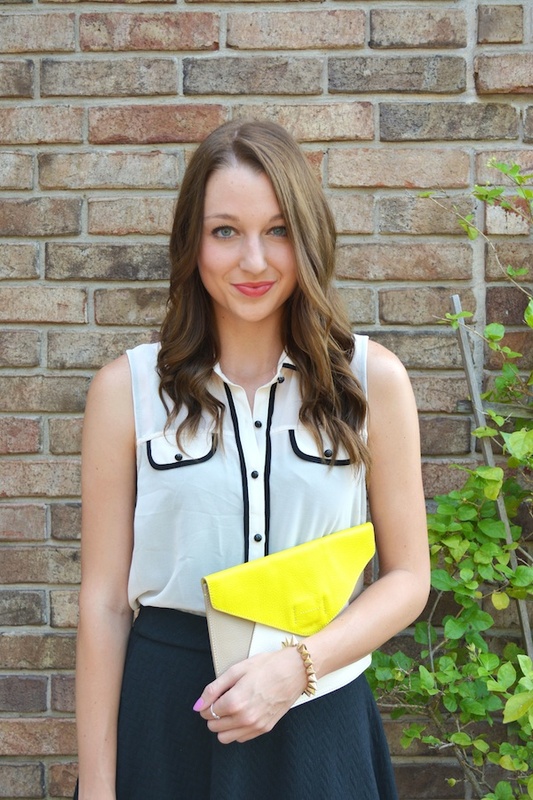 I totally agree about loving neon in small doses and your clutch is an absolute perfect addition to this outfit! As always, thanks for your sweet comment on my blog love! cute pop of color with the clutch! have a great weekend. Adorable and chic as always! Love the colors and geometric lines and shapes in this look. Cute and chic at the same time! what a darling top! love the black linning detail, and super cute clutch! Very cute!! Love the combo!